In a foil pan, place the diced potatoes, diced red pepper, diced onion, salt, and pepper. Mix thoroughly. Sprinkle 2 cups of the shredded white cheddar cheese over the potato mixture. Mix gently and set aside. Mix the parmesan cheese and heavy cream together. Pour over the potato mixture. Top with the remaining 1 cup of shredded cheddar cheese. Place the foil pan on the smoker grate and smoke at 275 to 300F for 45 minutes or until potatoes are tender. Stir mixture a couple of times through the cooking process. Mix together cornmeal, flour, sugar, baking powder, baking soda, salt. In separate bowl whisk eggs until foamy; whisk in milk. Add wet ingredients to the dry and stir until just combined. Fold in bacon, chipolte, and chives. 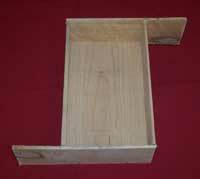 Pour batter into parchment lined plank roasting pan (see picture). Smoke at 300 for 70 minutes or until done. In a saucepan, combine sugar, cornstarch, water, salt, and butter. Cook until thickened. Layer the apples and potatoes in parchment lined plank roasting pan (see picture), sprinkling cinnamon between layers. Pour sauce over the casserole. Smoke at 300 for 1-1/2 hours or until done. demonstrated at New Paltz Event!!!! Directions: Prepare a plank roasting pan by lining it with two sheets of parchment paper. Obtain 300-350 temperature on smoker. In large bowl, combine eggs, cream-style corn, sour cream, and melted butter. Stir in whole kernel corn, cheese, onion, and chiles. Stir in corn muffin mix until just moistened. Cook in smoker until knife inserted in center comes out clean and the top is golden. Approximate cooking time: 90 minutes. Directions: Whisk all vinaigrette ingredients in medium bowl to blend. Season dressing to taste. Cover and refrigerate up to 6 hours. Prepare grill or smoker to medium-high heat. Place beans, radicchio, and artichoke hears in large bowl. Add 6 tablespoons dressing and toss to coat. Grill vegetables until crisp-tender and browned in spots, turning occasionally, about 3 minutes. Cut beans in half crosswise. Coarsely chop radicchio. Return vegetables to same bowl. Add greens and asiago cheese. Toss with enough dressing to coat. Season salad to taste. Serve warm.